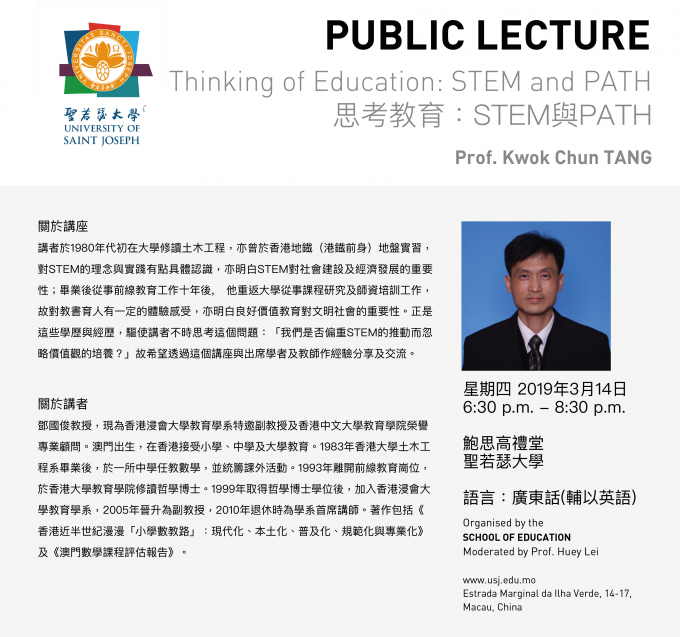 USJ's School of Education is organising a public Lecture titled " Thinking of Education: STEM and PATH"
The speaker studied Civil Engineering in the early 1980s, and had worked as an intern in MTR (Mass Transit Railway) construction site. Therefore, he has some close encounters of the theory and practice of STEM. And he also realises the importance of STEM for social and economical development. After ten years of frontline teaching since graduation, he went back to university to teach and conduct research on curriculum issues and teachers’ professional development. Through this journey, he gained fruitful experience in educating people, and recognised the importance of values education in modern civilised societies. Because of these professional qualifications and experiences, the speaker often ask himself this question, “Are we stressing too much on STEM education, but neglecting the cultivation of individual’s values?’. The speaker will share with the audience, particularly school teachers, his experience in this public lecture. Prof. Tang Kwok-Chun is an Adjunct Associate Professor of the Department of Education Studies, Hong Kong Baptist University. He is also an Honorary Professional Consultant of the Faculty of Education, Chinese University of Hong Kong. He was born in Macao, and received his primary, secondary and tertiary education in Hong Kong. After graduating from the Department of Civil Engineering, the University of Hong Kong in 1983, he started to teach mathematics in a secondary school and coordinated extracurricular activities. In 1993, he left his frontline teaching post and pursued his PhD study at the Faculty of Education, the University of Hong Kong. After earning his PhD degree in 1999, he joined the Department of Education Studies, Hong Kong Baptist University, and was promoted to Associate Professor in 2005. He was the Principal Lecturer of the Department when retired in 2010. His publications include:《香港近半世紀漫漫「小學數教路」：現代化、本土化、普及化、規範化與專業化》and《澳門數學課程評估報告》.